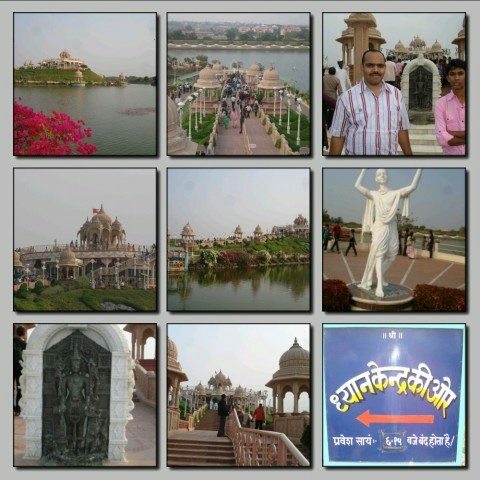 Anand Sagar - Shree Gajanan Maharaj – Shegaon, Maharashtra - Ghumakkar - Inspiring travel experiences. Hello friends! I am back with the continued tour of Shree Gajanan Maharaj, Shegaon in Maharashtra on the Mumbai-Nagpur route. 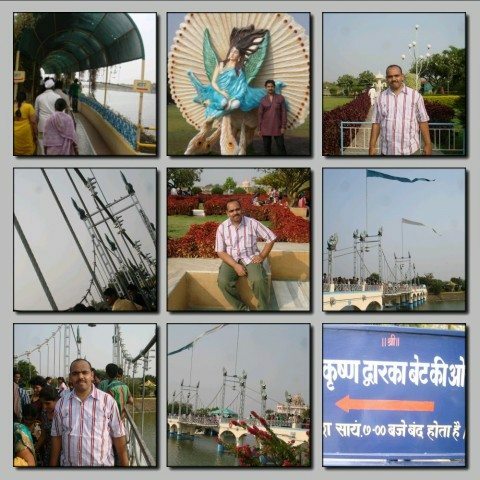 In these I will share with you the good & memorable moments we have spent at “Anand Sagar”. As we got the accommodation in Anand Vihar, after lunch we decided to go for Anand Sagar which was 1.5km away from Anand Vihar. One can easily reach Anand Sagar as there is regular free bus service from Bhakta Niwas 5 & 6, which drops near to the main gate of Anand Sagar and also one can reach here by Auto. As it was near Anand Vihar, we hired a shared Auto, which charged us Rs 10/- per seat. Before we move ahead, lets have some information about Anand Sagar. 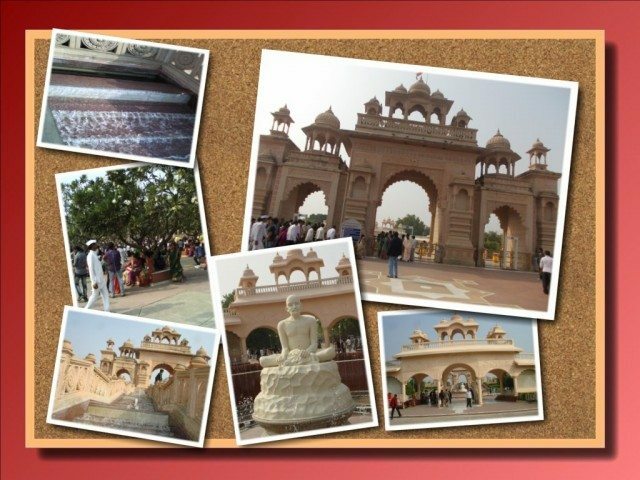 Anand Sagar is developed by Shree Gajanan Maharaj Sansthan, taking in to consideration the increasing number of devotees coming at Shegaon Mandir for Darshan, as there was no place nearby Shegaon to spare time. Sansthan has decided to develop a place which should be spiritual as well as entertainment Center for Devotees. Anand Sagar is spread in 350 acres area, and the main work of project began on 8th April, 1999. The Sanstha was facing water problem, which was big challenge to them and they brought water from Man River which is 9 km away from here & done rain harvesting which help them to overcome water problem. Around 500 laborers & around 200 expert Sculptors from Rajasthan worked here to create main Entrance, Marble Temple & other Sculptures. Initial estimation of the project to be implemented in three phases was of 300 Crore Rupees. It was dedicated to Country on 12th December, 2002 by Vice President, Hon. Shree Bhairavshinghji Shekhawat. 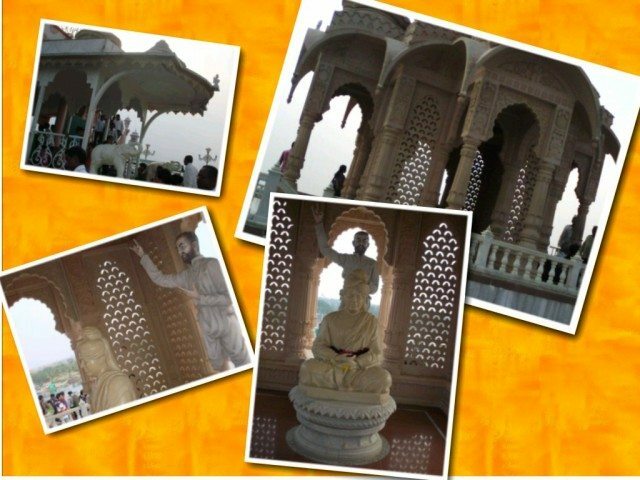 Anand Sagar is a huge complex with a big lake, several Green Lawns, Children’s Playing area, Temples, Meditation Centre, An Fish Aquarium, Open Theatre where Fountain show is conducted, Beautifully decorated with Sate of art artifacts & carvings all over Area, an Amusement park with a Toy Train encircling the entire place. In Anand Sagar around 50,000 trees of different types has been planted. An Artificial island of 300’ x 60’ x 40’ size has been created in the center, to create same as Swami Vivekanand Center at Kanyakumari. In which there is “Dhyan Kendra [Meditation Centre]” & Statue of Swami Vivekanand with around 30’ to 35’ size. There is a good facility for dining at economical rates. There are many amenities for the devotees, including free wheel chairs, baby prams and Umbrellas. To cover all places at least in Anand Sagar it will take around 8 to 10 Hours. Now let us move ahead with the journey, as we reach Anand Sagar there, Big Ganeshji created with the help of many small coppers LOTA’s on the Main gate, which was attracting the people. Many of them try to catch in Camera & we too. As we go ahead we show there is Queue to Entrance Ticket, they Charge Rs. 30/- , I stand in queue and one Sevak come & update details of number of person & age group & given slip to be given on window, after 10 minutes my number come & I got the entry ticket. If someone has given Donation, then there is no entry fee for them; just they have to show the Donation receipt at the Ticket Window. Just near to the window there was a huge Entry gate & we all have to pass through security check, as we entered there was a water flow nearby steps and in front there was a big fountain & in between there was a statue of sitting Saint & just opposite it was covered with status of other saints. Just we were moving we pass by Ganesh Temple, Big Greens lawns & everywhere there was some message posted in between & direction signs, which help a lot. We entered a place called “Shri Krishna Dwarka bet” to reach there we have to cross through Bridge, which was on rope & use wooden to make, after crossing bridge there was statue of Shri Krishanji & shown there Leela & ahead there was a park & dinning place, in which where was too big queue to take a coupon for snacks & everyone & we too enjoyed snacks & drinks. Now it’s time for us to move fast, because we have short time & still we have to cover too many things, so we moved towards “Dhyan Kendra”. 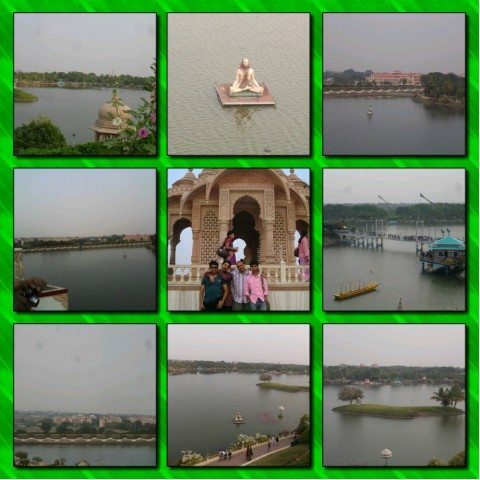 As Anand Sagar has huge water reservoir & spread around 55 acres land. An Island is created in the center of the lake. A replica of Swami Vivekanand Center at Kanyakumari is created on the Island. 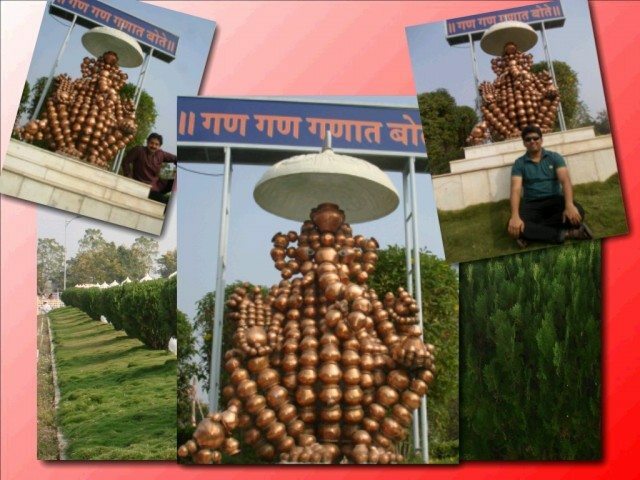 A Statue of Swami Vivekanand constructed on the top & below there was a meditation hall created, in which there is no permission for the children. To reach their boat Service is also available. As we reached to Dhyan Mandir, on the main door Sevak has informed us to switch off cell phone & keep silence & go ahead, we move head & reach place where Status of Swami Vivekananad & Saint Ramakrishna Paramahansa was there & it’s was above the meditation hall & as the place was little above, view from there was very good & we can see the beauty of Anand Sagar. After that we gone at Meditation hall & done meditation for some time & move from there as it’s was already 5.00pm. It’s time for us to move ahead & by walking we have seen the Toy Train passing by & we decided let have a ride on it, as we reach the station from where it’s start’s, there was a big queue & some who has tickets were waiting for train too come, so we drop plan the & decided to take some break & rest on a Green lawn. After Break it’s time for us to move ahead, Nearby there was Shiv Temple & carving of temple was very good, Entry gate of temple was just like some Old Temple with good carving & Temple was surrounded by 4 big size “Diva” & 4 big size “Nandi” , by flowers & by Green lawn. Just near to Temple there was refreshment center & opposite there was kid play with rides. After taking some snacks we move ahead to see “Fish Aquarium”, as we reach there was small queue & as we entered in Aquarium it was like we are entering in cave & there was little light. As we go ahead there was good collection of fish. It was already 6.15pm & we have to see Open Theater Musical Fountain Show which was at 6.45pm to 7.00pm, & there was also 2 more shows after that & we decided to see 6.45pm show & still we have half an hour to move around, but we decided let move so that we can grip front seat, as we reach at Musical fountain, it was already crowded & it was in an open area created like a theater & given the shape of chair using green lawn. People were already seated, but still there was place & we got as we desired. As there was time to begin in between there was continued announcement regarding the information related to Shree Gajanan Maharaj Sanstha, Colleges & Musical Fountain & Requesting so take seat in front of fountain. Open Theater Musical Fountain is a type of animated fountain that creates an aesthetic design. This Achieved by employing the effects of times sound waves and timed light against water particles. The Water Refracts & reflects light & in doing so, three dimensional image can be produced. As it was already 6.45pm, all lights was off & Music was stopped and after some time show starts, it was really worth & we were just involved in the show that we never know how these 15minteus has gone & show has been finished. 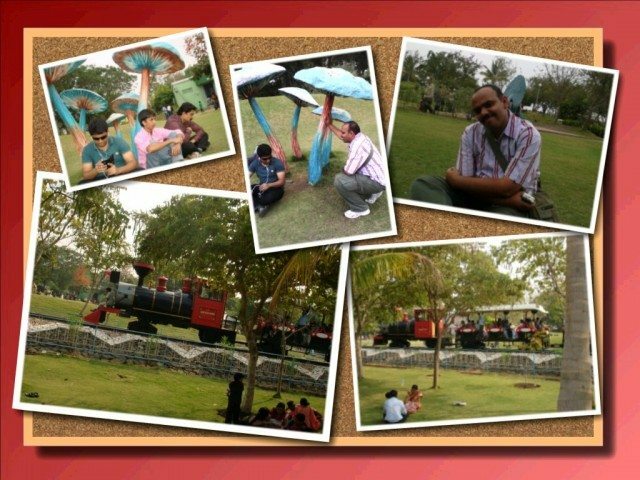 It’s time for us to move by taking some sweet memory of “Anand Sagar” a great place. As we reach to exit point, there was a big queue for free bus & as we were too much tired after full day roaming in Anand Sagar & have no power to stand in queue & wait for bus, so decided to take Auto & auto has charged as Rs 20/- per head to drop near Bhakta Niwas 5&6. As we reached near temple, there was big queue for Darshan, so we decided to have “Mukh Darshan” in which there were few devotees in queues. After an hour we have done Darshan. After Darshan we have taken Abhishek Receipt for tomorrow morning, which was in the temple premises & it will save time in morning, receipt can be taken in morning also as counter open early in morning. It is advisable to you please visit Anand Sagar whenever you visit Shegaon & I am sure you & your family will enjoy at Anand Sagar… Gan Gan Ganat Bote. Before I end, just want to summarize the Whole things which will help you to plan your trip at Shegaon. 1. Please try to make travel plan on odd day such as Tuesday, Wednesday or Friday when you will find less rush at Shegaon & you can take Darshan peacefully. On Thursday & weekend there is always rush. 2. While travelling at Shegaon – Train is the best way to reach, From Shegaon Station to Temple there is free bus Service provided by the Sansthan & you can also hire Auto @ Rs. 10/- per seat, which runs 24 hours. 3. As you reach near Bhakta Niwas, you will find agent roaming around & they will try to convince you for lodging outside the Bhakta Niwas, please never pay attention to them & Check the status at Bhakta Niwas, as Sansthan has lot of room for devotees. 4. After you do Darshan of Shree Gajanan Maharaj, please do Darahan of Ram Temple & Hanuman Temple & Apply “Angara” Near hanuman Temple. 5. Try to have Mahaprasad, which begins after the Aarti. 6. For Food use dining facilities provided by Sanstha, were you will good quality food & at reasonable rate. 7. For Anand Sagar at least you should spare 6 to 7 hours. 8. Try to have “Kachori” which is famous in Shegaon. Thanks for reading & if I miss something, please update me for the same. Gan Gan Ganat Bote! Hello, I am Ramakant Agrawal from Kalyan near by Mumbai; I am MBA by Education & working with Trading firm in Mumbai. 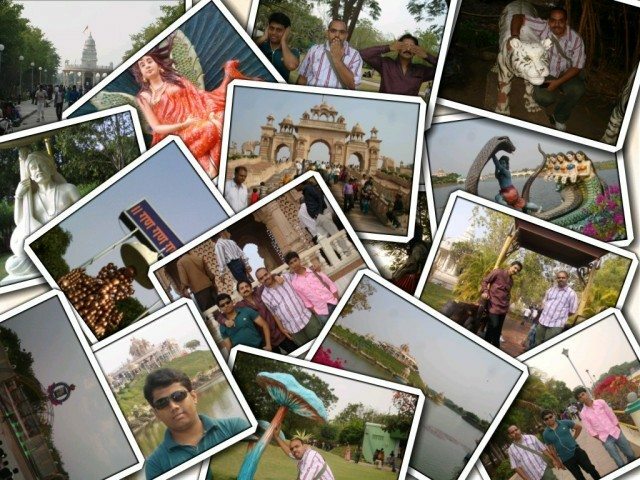 I like to Travel a lot, especially at Religious Places & share the experience with other devotees. Thank you Ramakant for such a detailed account of ‘Anand Sagar’. It must be a boon for all ages who are visiting Shegaon. Your log would be very useful for anyone planning a trip. First of all the post was very well written and photographs were too good. I would like to give you a feedback, actually mixing of photos looks good but some times not always. Because of mixing, the size of pictures becomes very small which does not give real feel of the place and also it creates hindrance in enjoying the post. This is my personal perspective and I don’t know what other readers think, but this is true that if the photographs in this post were bigger in size and separate rather than mixed, it would have added four moons to the beauty of the post. In my next post i will surely take care regarding the photo’s & thanks for your comments. thx fr sharing valuable information it will really help me to plan for trip. I only wanted to know which is the best time for d visit . The Best time to visit Shegaon is in between October to Feb.
i had knowledge about this place but u r log with pics helped me understand the place & spare time accordingly, i will definitely visit this place in near future. Accommodation facilities by Sansthan is near by Temple know as Bhakta Niwas & also Ananad Vihar & Anand Sagar Visava which are located near Ananad Sagar, please note that there is no accommodation facilites at Ananad Sagar. There is no advance booking system, here system is first come first service. If you have more queries please free to ask. 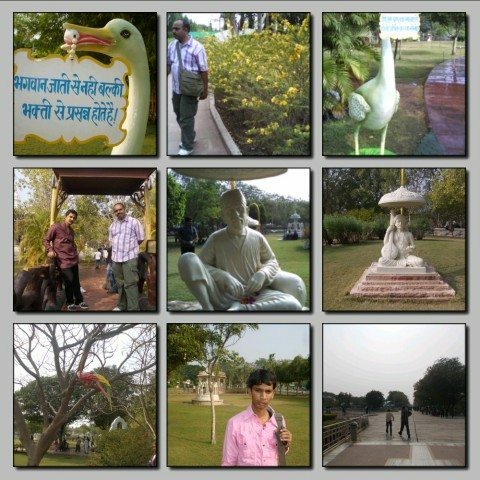 We have visited on 22/11/14 to Shegaon.It was awsome expericence.The place is very beautiful neat, clean and silent. Hatts off… to Swayansevak who are doing there jobs magneficently. Must visit place. 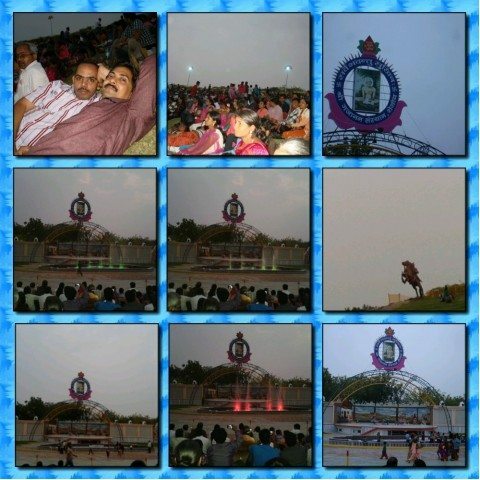 Anand sagar was also great to watch and enjoy. Foods,snacks are also best quality and price. Overall very good experience. You must visit this place. 1. are there any taxi/cab services available so that visiting all places at anand sagar becomes comfortable. I am 66 years old and am suffering from knee pain. 2. we are reaching shegao at 4.00 am.when does the bus service from station to temple start? 3. is there any direct bus from station to anand sagar? 5. can accommodation be booked before hand near anand sagar? 1. Shegaon is an small village & you can easily get Auto’s on sharing basis or you can hire it full. In Temple Premises & Ananad Sagar there is wheel chair facilities also. 2. Sansthan play 24 hour bus service from Railway Station to Bhkata Niwat to Ananad Vihar. 3. There is no direct bus from Railway Station to Anand Sagar, you can hire an auto, which will charge you Rs 10 or 15. 4. Distance between Railway station to Anand Sagar is approx 3km. 5. Good news for you, Sansthan has started online booking for Anand Vihar, which is 1km before Anand Sagar, please note In Anand Sagar there is no Accommodation Facilities. with the help of the information provided by you I could plan our trip well in advance specially being able to book online at anand vihar was very helpful. thank you once again. And what an experience that was!! Simply devine infact beyond words. Its time we promote Indian Management of this selfless ,seamless and dedicated kind. ” Sarve sukhina santu, sarve santu niramaya”in true sense. Below is some of the important contact number of Shre Gajanan Maharaj Sansthan, Shegaon. i want to go to shegaon but can they allow coupels to stay in sansthan. In Shegaon, Sansthan allot Room for couples & family only. No, you can hire auto. But, no need to have separate taxi/cab/auto. You will find the Sansthan Bus service with free of cost. 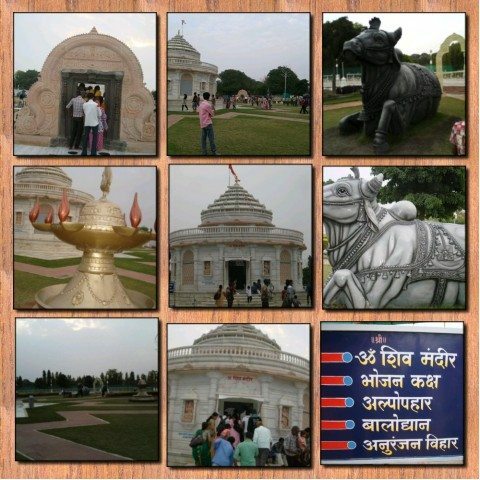 It may be there for tample (bhakta niwas) only from there you can get bus for Anand Vihar ans Anand Sagar. I think Anand Vihar will be best suitable for you. As it starts from 2,3, 4, 6 beds room. 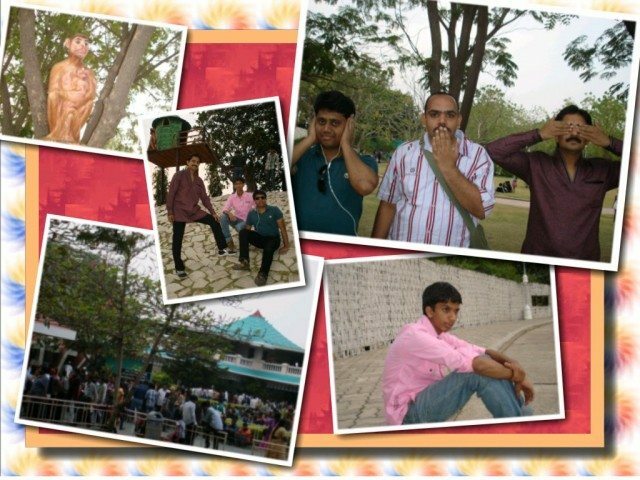 and Anand Sagar is well suited for big groups as per me i.e. 10 peoples, 50, 100, 200 peoples in groups, as per the information I have. I could use the on line booking facility with some constrains – I had difficulty in defining relations as my daughter, sister in law and myself were planning to visit. I wish to suggest here that if all the three occupants are either female or male booking online should be allowed regardless of their relation.It may not be possible for only a core family like husband wife and a son or a daughter to make a visit together. It becomes difficult to plan a visit specially from a long distance place without a sure accommodation. Kindly consider this in the online booking filters. Sir,I’m Palmate Aditya Tukaram from Latur. Firstly thanks a lot for giving us this very important information.I have some question that-1)What is the time of Mahaarti ?2)What is the opening time of anand sagar ? 5.00 AM – Opening of Shree�s Temple and Shri Ram Temple with auspicious musical notes. 5.30AM -Kakda Aarti in Samadhi Mandir and Shri Ram Mandir. 5.30 to 7.30AM – Panchamrut Pooja with all rituals. 5.30 to 7.30AM -Abhishek by devotees on Shree�s Paduka [along with Atharvashirsha] and Abhishek at the holy place of Samadhi by the deputed Priest of Sansthan. 11.00 AM- Shree�s Panchopchar Pooja, Aarti and Mahanevedya. 5.00 to 6.00 PM -Haripath. 5.00 to 6.00pm- Shree�s Palkhi (A devotional Procession) around Shree�s Temple on every Thursday and Dashami. At Sunset – Shree�s Panchopchar Pooja, Aarti and Nevedya. 8.00 to 9.00pm – Bhajan and Panchapadi. 8.00 to 10.00pm- Kirtan (on every Thursday, Dashami, Ekadashi and on important festivals). 2. Opening Timing of Ananad Sagar is from 9 am. if you need more information please free to ask. Dear ramakant, we are planning to go to shegaon coming August this year I can say may be on 10th August. 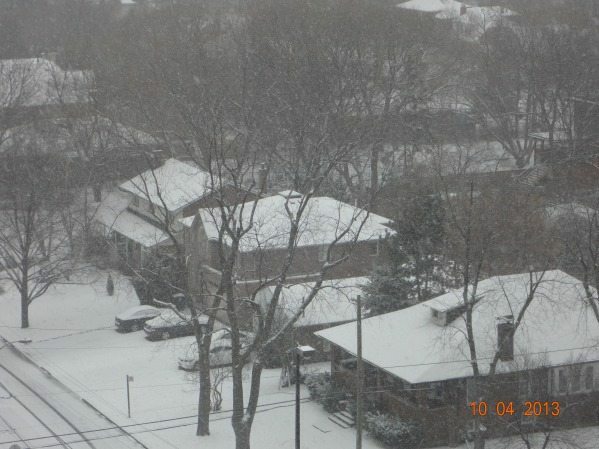 And we are planning to stay 2days there. Will august month ideal time for us. how much days of stay required for Shegaon trip with family? n will u list d places to visit in d trip? 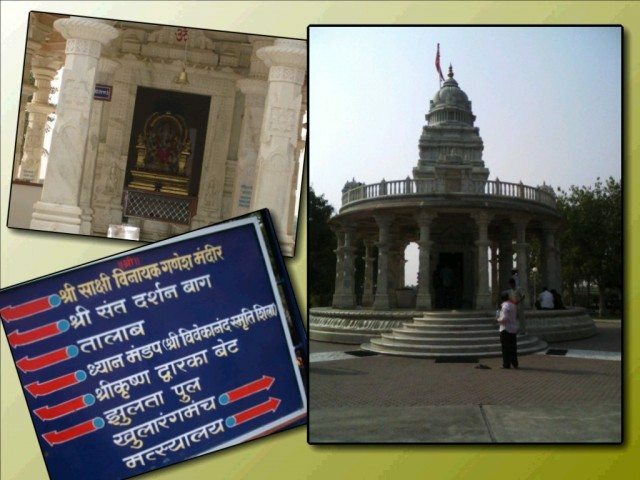 Shegaon is an small village, for shegaon trip 2 to 3 days are enough. How about travelling from Mumbai to Shegaon? Trains especially. Hi I have one query, we are visiting shegaon in dec 2018,is there internet facility(wifi) available or does phone network works fast in Anand Vihar/Anand Sagar, as I have to work for office sometime in evening.